This photo is of my friend Diane Padgett is from the Construction News site. Diane has a study which overlooks the South Thames construction site in London. Recently having attended a course by the poet John Hegley, Diane told me that one day she decided to pen a poem about the driver of the crane she found herself watching every day. Most people would have left it at that. What really impresses me about Diane, however, is that she approached the company, BAM, to ask them if she could read her poem to the crane’s driver on Red Nose Day. BAM readily agreed, and after she done a reading of her poem, she was then hoist into the sky (rather her than me). Here’s coverage on the BAM site. 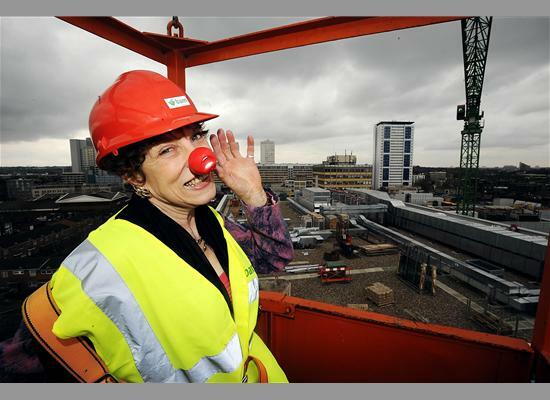 Not only did she – quite literally – raise her profile as a writer, being photographed in a cradle high above London, but she also helped to raise money well into four figures for the good causes supported by Red Nose Day. And quite rightly BAM received positive publicity too. Everyone wins. Simple but brilliant. WH Auden famously wrote in his poem In Memory of WB Yeats “For poetry makes nothing happen”. This is something I have never agreed with. Diane made something happen with her poem, by working out how to use it to create an interesting event that generated money for good causes. All day long – my hero! And wish he was my buddy. He’s just so, oh – kinetic. But way too far above me. Or lob him a hot dinner? That might be a winner. It’s all so very tiresome. While gazing from her casement. This entry was posted in Uncategorized and tagged BAM, Cranes, Diane Padgett, John Hegley, Red Nose Day. Bookmark the permalink.